I have fond memories of my five weeks traveling through Italy. I’m not a big fan of Rome. Florence, on the other hand, is my favorite Italian city. In a couple minutes, you’ll understand why and hopefully will be wanting to visit yourself. It could easily be said that Florence was the birthplace of the Renaissance. The Medici family funded much of the artwork, and many pieces remain on display to this day. At the Academy of Florence Art Gallery, you can see the original David sculpture among other great works of art, or you can see a smaller replica outside the Palazzo Vecchio, a 13th-century fortified palace which is currently the town hall and a museum. The original David statue stood out front for centuries before it was moved to the Academy and replaced with a replica. 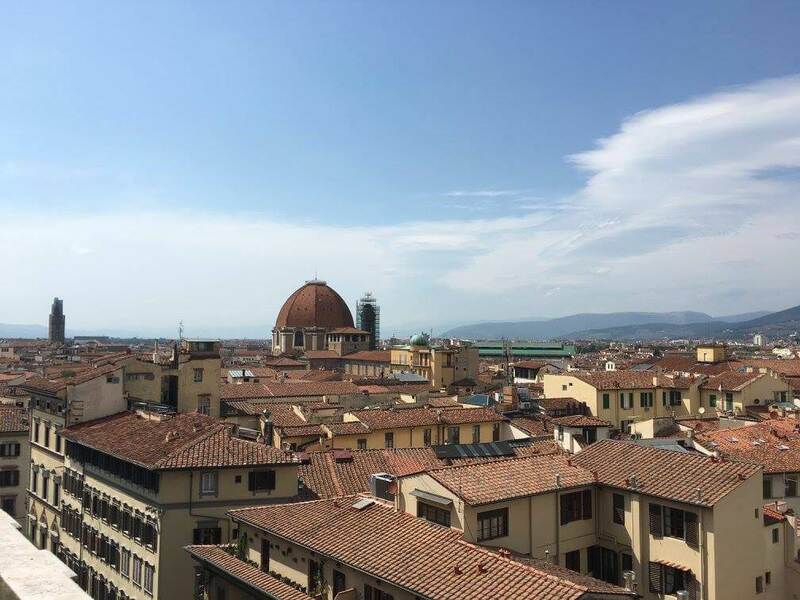 If you’re looking for a more relaxed part of town, consider visiting the Piazzale Michaelangelo and Botanical Gardens, situated on a hill on the south side of the Arno River and overlooking the city. Not far from there, you can visit the Forte di Belvedere, an 18th-century fort on the hill with even more art exhibits. If you’re a fan of fantastic photos, there are plenty of locations around town. Spanning the Arno River is Ponte Vecchio, the famous bridge lined with jewelry shops. Just down the street from there is the Uffizi Gallery, yet another world-famous art museum. Near the new train station are the Basilica di San Lorenzo and the Basilica di Santa Maria Novella, two beautiful churches – the former being the burial church of the Medici family and the latter with a unique marble facade. Finally, in the center of town is The Baptistery of St. John and Giotto’s Bell Tower. You can climb the 414 steps to the top of the bell tower to get some fantastic views. 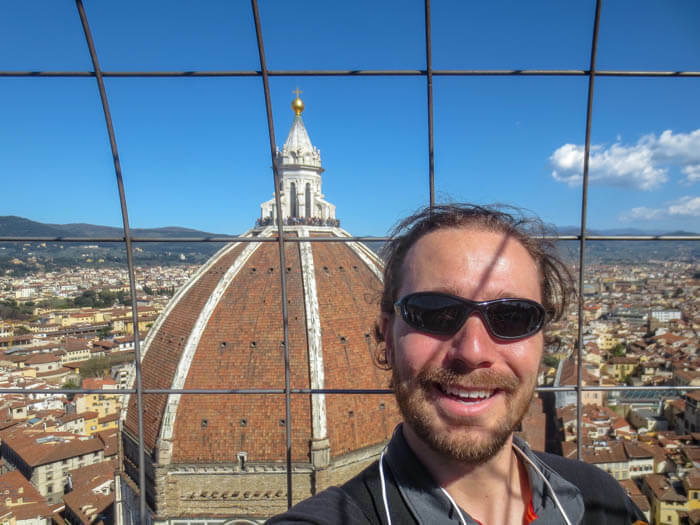 The heart of everything is the Cathedral of Santa Maria del Fiore, commonly known as the Duomo of Florence…but more on that later. Do you like ice cream? If so, you’ll love its Italian counterpart – gelato. 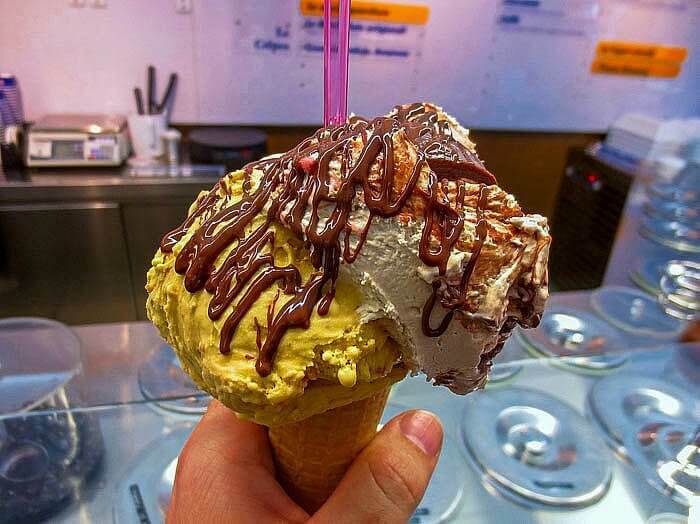 Just to be very clear, gelato is not ice cream. For starters, there’s no cream. True gelato is made with whole milk and fresh, natural flavors. There are plenty of corner shops in Florence selling mounds of colorful gelato, but that’s not the stuff you want. Mixed in with these tourist traps are some true gems. Real gelato doesn’t last long. It melts, loses its flavor, etc. when exposed to the air. As such, a proper gelateria will have the gelato in steel canisters with lids on top. Central markets are quite often the best place to eat in a city. Florence is no different. Located near the new train station (Firenze S.M.N. ), the Florence Central Market is a massive, two-story building where you can satisfy all your culinary cravings. On the ground floor, dozens of stalls have every kind of foodstuff you might need, straight from the farms. You will find meats, cheeses, fruits, vegetables, bread, fish, spices and more. On the second floor are all the stalls and restaurants selling farm-fresh meals. Here you can find your handmade pizzas, handmade pasta dishes, handmade…yeah, basically everything is made from scratch right in front of you. You can also take wine tastings, cheese tastings, or a full feast tasting on a food tour. 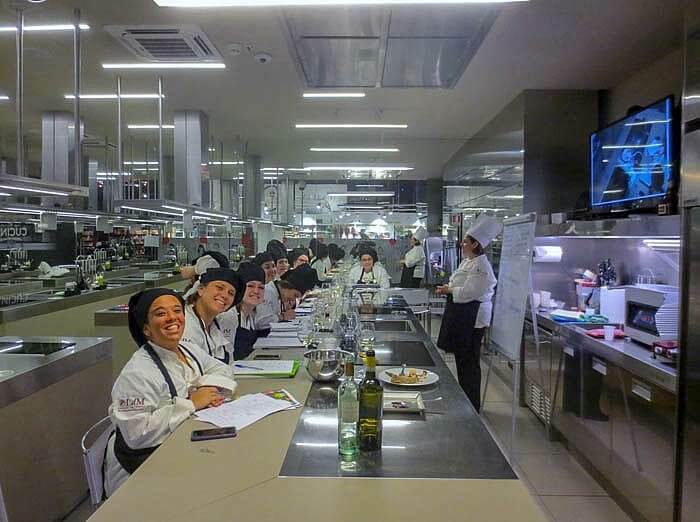 If you want to go one step further, join the Cooking School of Lorenzo de Medici and make your own pasta and dessert from scratch. The class fee includes a glass of wine to enjoy with your creations. Without question, the highlight of Florence is the Duomo. A duomo is actually any Italian cathedral. In this case, it’s the Cathedral of Santa Maria del Fiore. Construction took place between 1293 and 1436, and it is one of the largest churches in Italy. Along with the Baptistery and bell tower, it is part of the UNESCO World Heritage Site covering the Historic Center of Florence. To this day, the dome of the church is the largest brick and mortar dome ever constructed. The church is open to the public, but can only be truly appreciated with a Florence Duomo Tour. The tour not only lets you skip the lines and climb to the top of the tower, but you’ll also get exclusive access to unique parts of the church such as the central nave and the Santa Reparata Crypt, all the while receiving information from a professional guide. As a note, make sure you wear comfortable walking/hiking shoes, keep your shoulders and knees covered and bring some water with you. There are a lot of stairs to climb, especially if you include the bell tower, and it can get quite hot in the summer. Florence is not a city you can easily see in a single weekend. 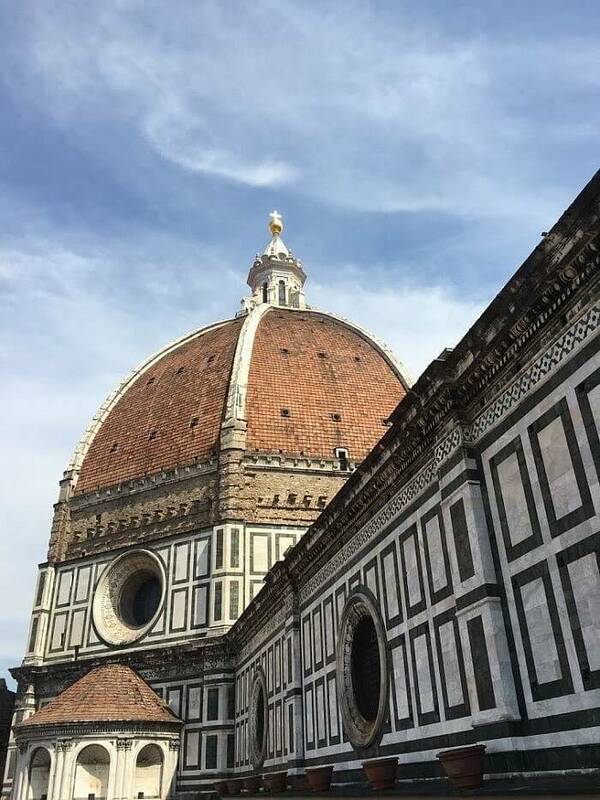 If you choose not to take the guided Florence Duomo Tour, you could be waiting for several hours in a line which stretches around the block…even in the off-season. While the above are my favorite highlights of the city, there are dozens of more gems I could have talked about. One of my favorite sandwich restaurants is in Florence. Lastly, no visit to Florence would be complete without finding the Fontana Del Porcellino. It’s the Pig of Florence, and rubbing his bronze nose will guarantee that you will return to this wonderful city someday. I wonder how much better the gelato is there compared to the USA. I used to work in a gelato shop in Florida. That stuff is tasty! If I remember correctly, it was about 3 Euro ($3.50) for a cone with 2-3 flavors.